The new version 5.0.4 of PHP DataGrid is available for downloading from here. There are some changes in this version. Read carefully Getting Started. Feature: [added] new attribute for password fields: "cryptography_type"=>"aes|md5"
Feature: [added] new attribute for image fields: "linkto"=>"", where possible value is "details"
Feature: [added] non-documented property: navigationBar, that allows to display additional info, inks etc. Feature: [added] new driver for firebird/interbase database. Special Thanks for Vincenzo. 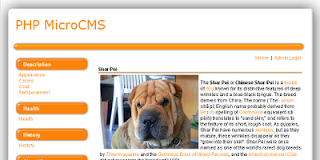 PHP MicroCMS (PHP MCMS) is a simple, but very powerful Content Management System that everyone can use. It's very easy to install by web developers, webmasters, graphic designers etc. PHP MCMS was developed in OOP and allows users to build websites in minutes. The new version 5.0.3 of PHP DataGrid is available for downloading from here. • Feature: [added] new attribute for calendar filtering fields: "calendar_type"="popup|floating"
• Feature: [added] new attribute for barchart type fields: "display_type"=>"vertical|horizontal"
• Feature: [added] new attribute for fields in view mode: "header_tooltip"=>""
• Feature: [added] new non-documented attribute for fields in view mode: "sortable"=>"false|true"